Beneprotein by Nestle Reviews - Is it a Scam or Legit? Beneprotein by Nestle promises to deliver a high protein powder, using 100% whey isolate, for those who are looking to supplement their protein intake. What is Beneprotein by Nestle? Nestle’s Beneprotein is an instant high-quality whey protein powder that contains six grams of protein in each scoop and can be mixed with a variety of foods and hot and cold beverages. It’s ideal for individuals who need extra protein to add to their usual diet or to elevate protein requirements during the body’s recovery process, as it promotes wound healing, muscle strength, skin health, and improved immune strength. The supplement is unflavored and uses 100% whey protein isolate and soy lecithin. You won’t find any sweeteners or fillers, and it contains only 25 calories per scoop. It’s suitable to use in a lactose-free, gluten-free, low-residue, or kosher diet, but isn’t suitable for individuals with galactosemia. At first glance, it seems like a clean protein supplement without any hidden additives. The question is, what sets this supplement apart from other whey protein supplements? What exactly is whey protein, and is there any clinical evidence to support the health benefits the company claims to provide on muscle maintenance and tissue health? Whey is one of two proteins found in milk; the other is called casein. When manufacturing cheese, whey is the translucent, watery part of the milk that separates from the curds and is a mixture of protein, minerals, immunoglobulins, lactose, and trace amounts of fat. Although casein is also a protein, whey has a higher percentage of branch-chain amino acids, which the body can synthesize and digest faster than casein protein. Beneprotein uses whey protein isolate, which means the fat has also been removed and it’s lower in bioactivated compounds. Whey protein isolate is also known to be one of the purest protein sources as it contains concentrations of 90 percent protein. Who would benefit from taking a whey supplement, and how does the body process it? Are There Any Health Benefits of Taking Beneprotein? There is a lot of mixed information on protein supplements – if the body needs a protein supplement in the first place, or if the diet provides most people with the recommended daily requirements. A general misconception is that the body needs vast amounts of protein given the rise in high-protein diets. Although, according to the Dietary Guidelines for Americans, the majority of the population is already exceeding the total protein recommendations, which are a modest 0.8 grams of protein per kilogram of body weight. But protein is an essential nutrient in a well-balanced diet and is necessary for muscle repair and maintenance. It stabilizes blood sugar levels, reduces hunger cravings, burns fat, and boosts immunity. Some studies suggest that including a protein supplement such as Beneprotein will help boost energy and promote the recovery of muscle function and athletic performance. Although, according to Harvard Medical School, unless you’re a bodybuilder, taking a protein drink before a strength-training workout isn’t necessary. During our research, we also found scientific research reporting the benefits whey supplementation has on the immune systems in adults who have HIV. The reports showed that more lean mass increased and grip strength was improved by adding a protein supplement. Some other research we found suggest a positive effect on certain skin conditions, such as plaque psoriasis and eczema. We also found information suggesting that whey protein may help infants to be less likely prone to allergies and allergic reactions compared to those who receive standard formula. However, they advised avoiding the use of whey protein during pregnancy and breastfeeding, as there isn’t enough reliable information about the safety of taking it. Other research also indicates a positive effect on certain skin conditions, such as plaque psoriasis and eczema. One thing we noticed from the company’s website, as well as on other retailer’s sites, were the instructions on how to take this powder through a feeding tube. This information suggests that Beneprotein is a suitable product post-surgery where patients require a liquid diet. Does taking a whey protein supplement have any side effects or contraindications? Is there anything specific about whey isolate to bring to our attention? Does Beneprotein Have Any Side Effects? Unless you have galactosemia, the company claims that their whey protein supplement is suitable for most people. One thing to keep in mind is that if you are very lactose intolerant, you’ll want to consult with your doctor first to see if Beneprotein is okay for you. According to sites such as Healthline and WebMD, whey protein powders are safe for most people. However, high dosages can cause nausea, bloating, headaches, increased bowel movements, and other digestive symptoms in those with lactose intolerance. From our research, adding a protein supplement to the diet does have considerable health benefits when taken in the correct dosage, as they can be an easy source of complete protein. According to Healthline, whey protein is one of the best supplements on the market, and they suggest that you try whey protein isolate in particular if you do happen to experience any side effects. Sourcing the Nestle Beneprotein powder is easy as you can find in many stores. It’s available on Amazon, Walmart, Walgreens, eBay, and directly off the company’s website. You can also receive an additional 10 percent off auto-orders after you’ve registered and paid a $14.39 sign-up fee. Single orders, as well as all auto-reorders over $49.95, will also receive free shipping. The company confirms the high-quality of everything they sell, but if you’re not satisfied with any product from Nestle Nutrition they will refund the purchase or replace the product free of charge. What are Beneprotein Customers Saying in Their Reviews? Taste has a significant influence on our decision to purchase a product. If it’s right on the tongue, consumers are more likely to repurchase it. We looked at the reviews on Amazon, Walgreens, and Walmart which all gave it a 4.5 and above rating, but we were concerned with a few comments from the users. The company claims that the powder can blend well with hot cocoa or tea, but we found mixed reports. Some confirmed that it does mix well with hot and cold, but this was not the case with a few reviews where users complained that it did not mix well at all in hot liquid. Several other reviews mentioned that the although the package says “flavorless” it has a distinct flavor no matter what you mix it in. Some even said it had a nasty taste and that it was not flavorless at all. Overall, the ratings were reasonably satisfactory. If you’re in search of a suitable protein supplement to add to your diet, you might want to know the different types that are available to help you decide which one is best for you. Taking advise from Dr.Oz’s “Smart Guide to Buying and Using Protein Powders,” there are four types of protein powders – whey, casein, soy, and rice. Both whey and casein are derived from milk and are complete proteins. Soy and rice are suitable protein sources for vegans. However, since rice protein is missing one of the essential amino acids, it needs to be combined with other protein sources to make it a complete protein. In Dr.Oz’s guide, he mentions that the FDA does not regulate protein powders. So, when buying a protein supplement, you should be aware of powders that contain ingredients you don’t want in there, such as excess vitamins or minerals, as it may cause you to exceed the recommended intake levels, and increase your risk of toxicity. He also says to be aware of powders claiming, “extra energy,” as they may contain caffeine which doesn’t give you energy, just stimulation. Other ingredients to avoid are sweeteners as they not only give you added calories but can cause you to bloat and have unwanted gas. Naked Whey: This powder is a 100% grass fed whey protein powder. The milk from the cows contains no rBGH or rBST, it’s non-GMO, soy and gluten free, and non-denatured. One serving is claimed to provide 25 grams of protein and 5.9 grams of BCAA’s per serving, and there are no artificial sweeteners, colors, or flavors. The cost is $89.99 for 5lbs and is available to buy directly from the company’s website, as well as Amazon, and GNC. ISOPURE: An unflavored, whey protein isolate powder that contains 25 grams of protein for a 29-gram serving. The ingredients are only whey isolate protein and soy lecithin. The Cost is $ 18.57 for 1lbs and is available to buy from the Vitamin Shoppe, Amazon, and GNC. Comparing the Amazon ratings for ISOPURE, Naked Whey, and Beneprotein, they all received above a 4.0. Some people believe there is no difference in drinking a glass of milk or adding a portion of whey powder to a daily drink. The difference is in the price of a supplement, especially in high-quality whey powder. According to the advice given on WebMD, they state that milk, cheese, and yogurt are excellent sources of protein, calcium, and vitamin D. But if you’re looking to increase your intake of protein and need a high protein concentration of whey powder, it could be beneficial for you to add a supplement such as Beneprotein to your diet. 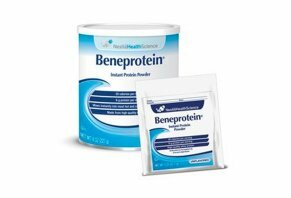 Our bottom line is that Beneprotein seems like a reasonably priced, quality whey powder that will do the job if you’re to increase your protein intake, and it seems to be an excellent protein supplement post-surgery where tube feeding is necessary. Write a Review for Beneprotein by Nestle!